The dominant aesthetic of software is utility, as distinguished from say truth, which is to say, art. As an artist, here, I wish to think about software as art, rather than as I would in my other occupation as CTO. Typically, software is for business where performance, cost, scale and a variety of utilitarian goals are foremost, all aimed at making software serve business. Software may, like paint, be useful. Where paint can be used to coat a house and protect it, it can also be used to make paintings. Paintings can be used to decorate and cover holes in walls, but they can also be illuminating. I’m writing this as a way to find a way to make the software I want to make. A software that is not about utility but says something else. An Art app in which you distribute it as a mobile app via the AppStore. The app is only to provide an awareness that one is holding this thing in one’s hand, and a sense of loneliness. Rather than say metaphysical connectedness and progress. How does one price it? Of course it must be free. The store also un-ironically and conveniently bypasses galleries. Writing & Compiling Code as a performance. Like writing about writing, useful and personally illuminating. It also involves the theater of teams and interpersonal dynamics and a variety of experiments (e.g. pair programming, and open-source). I’m not really interested in this, though I could imagine a theater of syntax errors, and Godot like wanderings on the road to compilation. If you don’t care about utility per se, then why would care about syntax? What is a bug? Running Code: code that runs slowly. There’s more here. What happens when it runs? Is it visible? Are objects exchanged? Between what and what? What is represented? Is it viewed only with a debugger — How is it translated for viewing? Consider software as an analogue of paint, its not the paint that matters, but what it represents… But paint is analog and unique… and software can be that way too. And each encounter with it is unique, even if the painting is unchanged. But paint is purely visual whereas software is not so constrained. Running Code: code whose sole purpose is to make the computing hardware get hot. Perhaps heating and cooling in some pattern. Code that exercises a chip and its components and interconnected hardware in some way… Then using a microscope with an infrared view of the chips RAM so that you can see that a flame has been drawn by the action of exercising memory addresses according to the actual physical location of the circuitry. And alongside this setup, a candle with a real flame. 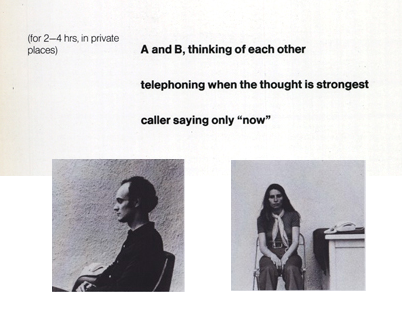 Before there was “social media”, far before the Facebook “like” button, Allan Kaprow, the ‘father’ of performance art, created a set of scenarios for participants to perform called “Comfort Zones”. In one of these scenarios, two remote participants, when they feel closest to the other, call the other on the phone and say only “Now”. Now, some 35 years later, millions of people do this performance daily. We press the “like” button, we comment, we network, we ‘link up’, we ‘connect’… but as in Kaprow’s work, are we really any closer? Every time we say “now” and get closer to our “friends” and “acquaintances” by clicking on the “like” button, or commenting on a “status line” we are saying “now” just as those participants are when the feeling is strong enough. In another of Kaprow’s Comfort Zone scenarios, the two participants are on opposite sides of a door and without being able to see the other. They are to press themselves on the door and try to align their selves to the other on the opposite side, whom they cannot see. They are to imagine or project what the other is doing and arrange themselves to be what they hope, or expect, or feel, or intuit to be in sync. Once they feel they are aligned they are to say out loud, so the other can hear, the single word “Now”. Are the participants friends or strangers? Or something in between? Or something else entirely? Are they closer as a result of their actions and exchanges? Do they understand each other better? Do they feel closer? I wonder and worry over what it means to be a friend… and the verb “to friend”. Who are my friends? And who are all my many acquaintances in all of the many worlds I’m in contact with: the business world, the consulting world, the technical world, the marketing world, the legal world, the art world, and my local drum circle to name some… So many careers, so many relationships. And yet I feel immensely lonely and isolated. But know that I’m working from my apartment, on a social media related start-up of my own, and that I work mostly with people I’ve never seen and know only through email, phone, and contracts, through resumes, references and reputation. And they are part of a “network” of acquaintances to which I’m linked. Acquaintances. I am closer to them then utter strangers, that is to say, to those I’ve never met, to those I don’t notice when passing on the street, and those I know only through the news, TV or YouTube? Am I much closer to “the people I know” than two folks standing on opposite sides of a door? Pressing on opposites side to be closer but they do not, cannot, and agree to not open the door? I wish so much to be able to open that door. Words are tossed around, there is social media language and you hear it from social media practitioners, in a sociological sense, of “community”, “relationship”, “friendship”, and so forth… And that’s in contrast to another different language that floats out there about love and interconnection and democratic power… I want to be a closer friend in the loving sense, but this social media stuff is not helping, and I even find it confusing. That is the languages and realities are not one and the same, and so while there is “community” and empowerment of people and groups on the one hand, I am no closer to you. As in Kaprow’s Comfort Zones as in social media, the participants position themselves and seemingly connect… they “like” and comment and network and link up and essentially say “now”. Is friendship and intimacy a state of alignment, being in conformity with, a synchrony with, a nearness, felt near, actually/physically near, enmeshed? We seem to be enacting everything of friendship but are we friends? It’s sad and beautiful all at once.